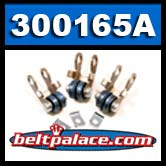 Comet 300165A Roller Weight Kit. 68 gram weights for Comet Industries 500/780 Drive Clutch. Package of 3. Comet 302293A - Pack of 6 "Purple" 500 Series Drive Clutch replacement Spring Kit, Purple.